Grind Espresso was recently awarded the ‘Local Hero’ award by The Sydney Morning Herald’s Good Café Guide 2014. Since moving to Cronulla a decade ago, I have seen the café evolve from a slither of a space on the Kingsway into an institution that has been well and truly colonized by the local community. And while most of the action at this warm and convivial cafe takes place behind the gleaming La Marzocca machine manned by senior barista Dan Lumb, owner Richard Calabro also enjoys the theatre of turning out artisanal brews from his tricked-out coffee science lab. I recently caught up with Calabro who demystified the various brewing methods. Here is his beginners' guide for home baristas keen to create hand-crafted java at home. The trick when it comes to crafting coffee using the Japanese siphon method is you need to make sure you can create the right vacuum. A Japanese siphon has two vessels, one of which you add water to, and the other one you add coffee to. A lightly roasted coffee is recommended. When the water heats up to the right temperature it starts to almost evaporate before it rises into the next chamber, which is only connected by a cloth filter. 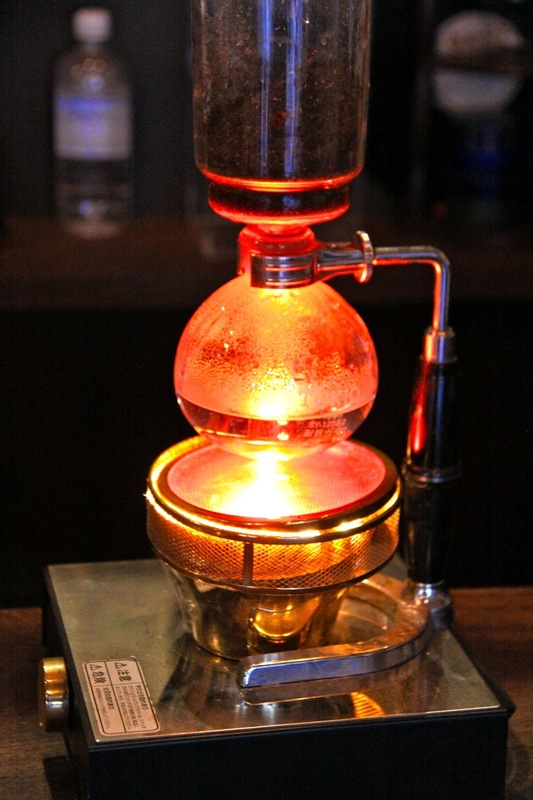 The Japanese siphon method works on the principle of expansion and contraction, which enables the contraption to brew an infusion-style coffee. This water mixes with the coffee and you then need to stir it together with a bamboo spatula to agitate the coffee and release all the flavours. When you turn the heat off, it creates a vacuum effect. The brewed coffee then cools down and starts to siphon back into the original bowl where the water initially sits. And there you have the brewed coffee, ready to serve. Filter coffee is going off. Why? Because it's childproof. It’s simple for anyone to make at home. Forget about the average coffee served in American diners as that is usually made using low grade coffee that is not of export quality. This makes it affordable to offer bottomless cups of coffee. In Australia, we use premium grade coffee and it is fantastic. A lighter roast is recommended. With a pour-over, you use 20-30g of ground coffee. You need to use 200-300ml of water just off the boil, pour into a little filter pot and then pour water over the top. You must then agitate the water with a paddle to release the flavours and it will filter through into another vessel or a cup and then you drink it. It’s as simple as that. Chill with a cup of cold-drip coffee. Cold-drip is an interesting one. It’s a cold brew, a chilled coffee. 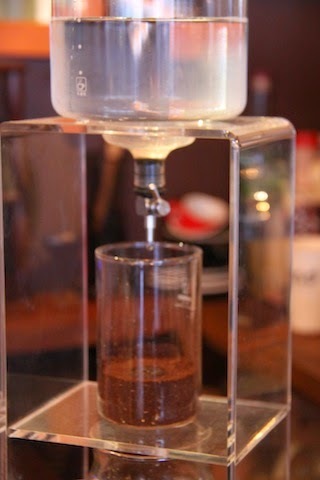 We use cold water to brew the coffee by leaving it to drip over the ground coffee for 6 to 14 hours. It’s done with cold water and is one you can do at home. It will cost you about $200 for the unit and it’s a good little method. With the cold-drip coffee, it takes so long to brew that it becomes thick, syrupy and sweet and almost tastes like a coffee liqueur without the alcohol. While many different origins would give you different flavour profiles, my favourite bean to use for this type of brew is the Burundi and the COE cup of excellence. The taste profile is insane: like chocolate and dark cherry. The AeroPress uses the ideal water temperature and total immersion brewing that extracts the full coffee flavour. AeroPress uses a paper filter and a medium-roasted coffee. The formula is 20g of coffee and 100ml of water and the way it works is you pour the water into the vessel that contains the coffee. Under that is a paper filter. Under the paper filter is the metal sitting onto a cup. When you push down on the plunger, the machine creates air pressure similar to an old lever espresso machine. It creates a hydraulic pressure with water and air squeezing through the coffee, through the filter and into a cup and it makes for a clean brew with less grounds. An AeroPress costs about $50 and comes with about 50 filters. I could show someone in two seconds how to use it. It’s a simple winning machine for dummies to use. Some home baristas go out and spend $2000 on an espresso machine and they still don’t know how to get crema because mastering the machine requires preparation and a bit of artistic passion. However, if you focus on an alternate brewing method, like Aeropress, all you need to succeed is fresh coffee. The Italian stovetop is still extremely popular with Europeans. Many people believe the stovetop gives the coffee a metallic, burnt taste so they use a cloth or paper filter. It’s mainly the eastern Europeans and Mediterranean who go for the unfiltered coffee. If you are making a stovetop espresso, you must add fresh coffee, ground to espresso, and wait for it to start to boil. When it starts to boil, it starts to percolate and that’s when you turn the heat off. The water will then be vacuumed up to the top chamber. If you don’t turn the water off after the coffee has boiled it will be so hot that it will go through the coffee too fast, release the bitterness and burn the coffee. If you turn off the heat, it will still release, but it will just slow down the speed of the water, which will eliminate a lot of that burnt, bitter taste. Turkish coffee uses a centuries-old traditional method. Turkish coffee originated some 500 years ago in Turkey and is now enjoyed everywhere from Arabic and Mediterranean countries to eastern European countries, such as Romania and Croatia. It’s a very old method and it's also unfiltered, so you’re going to get the grounds at the bottom, but you are going to get a lovely sweet tasting coffee, too. It’s quite a pure form of coffee because of the fact that it is unfiltered. There’s a lot of debate around the brewing method behind Turkish coffee. Again, coffee brewed the Turkish way is simple and idiot-proof: use a three-cup pot ibrik, which is the traditional Turkish coffee pot; a four-cup ibrik; and even a 20-cup ibrik. The basic rule is one heaped teaspoon per cup and one for the pot. I would add sugar and I would also add spices such as cardamom. Turkish coffee is exotic, appealing and intriguing and bit more romantic because it offers something that traditional brewed coffees will not give you. Grind Lane is located at 4/15 Surf Rd, Cronulla. For more information about how to produce great-quality coffee at home, read my article in The Sydney Morning Herald's Good Food.